C.1908, Ansonia Royal Bonn "La Orne" porcelain mantel clock as-found, with a 2" crack, lower left that we did not see until we cleaned some of the dirt away (see arrow just under crack in picture). 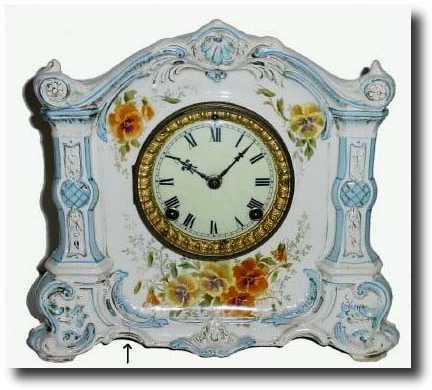 This particular clock with solid porcelain dial (cream colored). The case is white with light blue accents and orange/brown pansies. Retains crisp rear trademark and model name. The movement appears to have never been serviced, but still ticks and strikes, and there are no chips in the porcelain. Height 11"